Excellent! These girls write Great Tales! 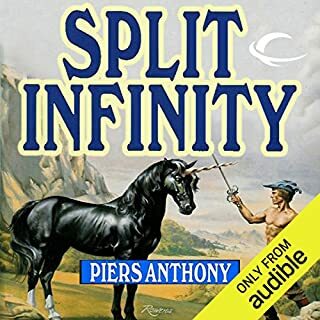 Legendary science-fiction/fantasy writer Piers Anthony combines fascinating magic with a gripping struggle between good and evil in this most ambitious series. As with the series' other stand-alone novels, Wielding a Red Sword depicts a mere mortal who is called to serve as a god-like incarnation. It is the thrilling story of Mym, an Indian prince who takes up the Red Sword to become Mars, the Incarnation of War. To avoid breaking his betrothal to the princess Rapture and the war that would surely result, Mym accepts the fearsome office. As Mars, he plans to keep Rapture by his side as he stops the suffering caused by Earth's incessant wars. But will Mym's princely training, even his abilities as a berserker, be enough to defeat Satan himself? 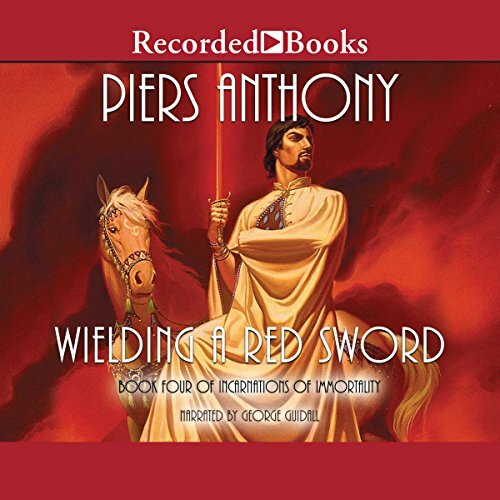 Piers Anthony weaves together adventure, romance, and Eastern and Western mythologies to create this charming allegory. Master narrator George Guidall delivers the elegant tale with a dignified tone and much dramatic flair. Don't miss the other books in the Incarnations of Immortality series. I was able to listen to the first 3 of this series through other ways. They all had the author's note as part of the audio narration. 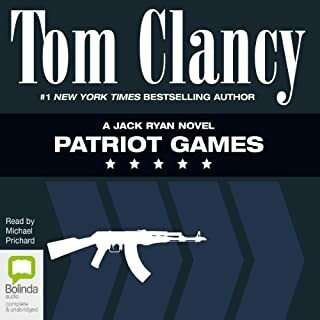 This was the first one that I listened on audible. It's missing the author's note. I remember these books from when I first read them. Then the author's note made a BIG impact on me. And now as I listen, I enjoyed the author's notes just as much. Leaving that off I feel like I'm missing a significant portion of the book. The fourth novel of the Incarnations series tells the story of Mym, a young Indian prince. As the story opens, Mym has fled his father's cort, believing himself unfit for his station due to a severe stutter and the presence of his more desirable brother. To make ends meet, he joins a traveling circus where he meets Orb, a beautiful young woman with a unique gift, the ability to put people into a trance whenever she sings and plays her harp. With the aid of his magic ring Mym aproaches Orb and soon forms a connection with her. As time goest by the two fal in love, but Mym is soon discovered and take back to his fathher. His brother is dead, meaning that Mym must become Raja uponhis fathher's death. Mym refuses to accede to the arranged marriage, resulting in the deaths of several would-be brides. Finall his father arranges for him to spend a month with Princess Rapture of Malachite at the Honeymoon Castle, a castle with magical properties that leave the thoughts of those who reside within the grounds open to one another. As time goes by Mym discovers that Rapture is indeed worth loving and finally agrees to marry her. Before the wedding can take place, the Raja changes his mind and begins to arrange a different marriage for Mym. This results in Rapture's father declaring war on Mym's kingdom, greatly angering both Mym and Rapture. Mym's anger draws a strange red sword to him, which e takes only to learn from Gaea, Incarnation of Nature, that he is now Mars, Incarnation of War and that it is now his mission to foil the plots of Satan, Incarnation of Evil. Mym has trouble wit this concept, having come from a completely different belief system. It's not long before Satan approaches Mym, and only time will tell whether Mym will have the necessary quickness of mind to avoid falling prey to Satan's insidious plots. All in all this is an excellent book and George Guidall does a fine job of bringing it to life. It's unfortunate that he doesn't narrate the next three books in the series. Disappointed about missing "Author's Note"
The first three books in this series had the "Author's Note" narrated at the end. 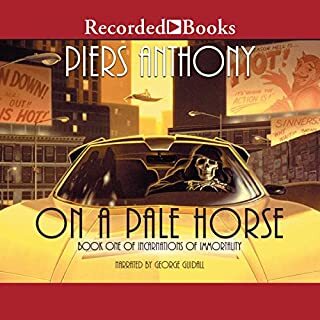 They provided a very welcome insight into Piers Anthony's life and writing. When listening to the last chapter of the book, I was looking forward to the "Author's Note". 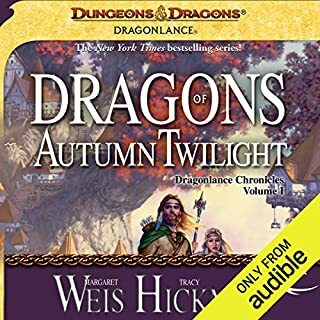 I cannot express my disappointment to have this omitted from the Audible production. Yes, I have the paperbacks and can read it, but I just felt I was lacking something at the end of the Audible book. As great a story as Pale Horse, but completely different! Funny, bittersweet, and brilliant! I like all of the 'Incarnations of immortality' books but this is one of my favorites, and the reader was absolutely wonderful. I am so glad to have this in my collection. I still like the series a whole, but this book is stearing away from the series style a bit. The course of War coming to terms with his office, in this book, is tangential series of reused fairy tales. Almost as if Piers was rushing it out for production. spellbinding like the books before it. I love the series this far and am about to continue on. so well spoken and blissful to listen to. This volume of a truly great series is probably tied with Green Mother as my least favorite of the series. At times it seemed as though the author was meandering about with no clear direction to go with the story. Having read much of his work, it is fairly evident when he is off his game. 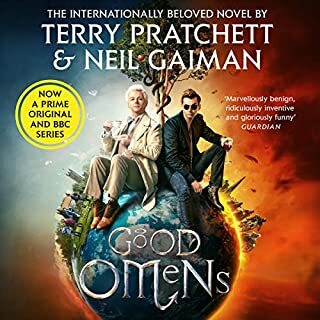 That being said, the book does fill in its corner of the series and when rolled in together with the other associated installments, it becomes quite palatable. 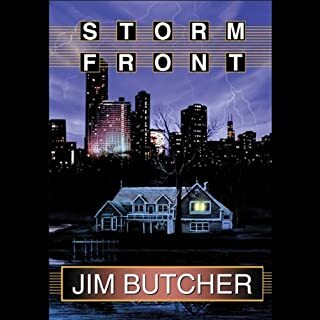 great book great story narrator not so good.would recommend this book and the rest of the series. not so much the narrator..
Another great book in the series. My only complaint is the lack of author's note.